UNISOL are indicator solutions that are directly applied to the sample. 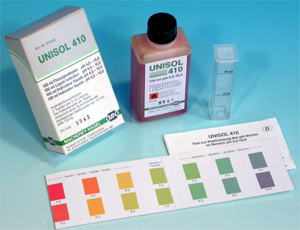 The resulting colour of the sample is compared to a colour chart that is included in the kit. UNISOL indicator solutions are especially suitable for pH measurement in non-buffered samples like pure water or surface water. In these samples, other indicator papers find their limit of applicability.